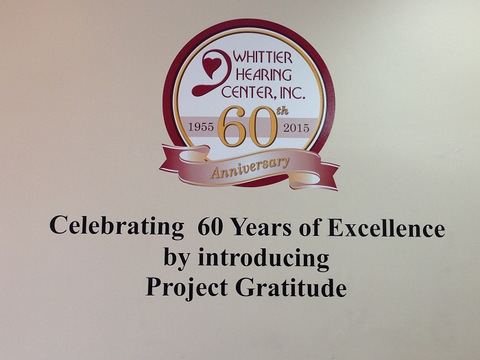 Located at 13121 East Philadelphia Street, the Whittier Hearing Center is staffed with caring professionals who specialize in helping you hear better. It all begins with an interview, which introduces you to the experts and will give you an opportunity to describe your hearing loss experience in detail. Followed by and examination and hearing test, you receive a diagnosis and cutting-edge treatment options that suit any lifestyle. The clinic has been so successful that it is celebrating its 60th anniversary this year. Vinyl Wall Graphics and Lettering That Pop! 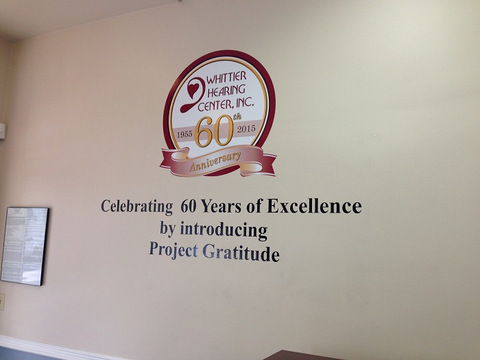 To mark the occasion, the hearing center’s management team contacted Superior Signs and Graphics to create memorable wall graphics and vinyl lettering. Orange County businesses like to use these products to commemorate special events in the history of their companies. Since a 60th anniversary is most certainly one of the most outstanding events in a clinic’s tenure, we were honored to work with the professionals. Our experts created wall graphics for the lobby and waiting room as well as lettering that is placed above the reception desk. The cream-colored walls and powdered blue backdrop of the office space are the ideal substrates for black and white lettering placed there respectively. 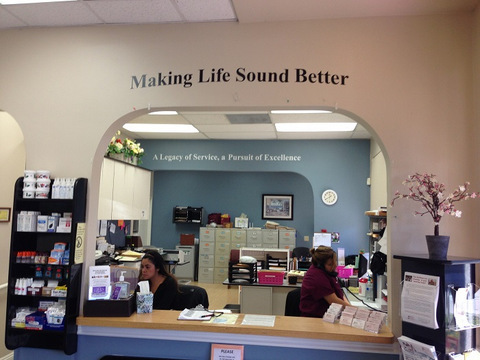 Patients, caregivers and visitors to the clinic are now greeted by the hearing center wall graphics and vinyl lettering. Orange County clinics that use this type of signage product report that patients feel more at ease and comfortable in their waiting rooms. In addition, the mention of the hearing center’s longevity in a world of businesses that come and go is a testament to the quality of care that is to be found there. Vinyl lettering affordable and attractive! Our signage experts get quite a few orders for these wall graphics. If you are considering this product for your setting, consider that the sizing and color choices are extensive. We can use a wide variety of fonts to fit in perfectly with the overall look of the venue. In addition, the high quality of the die-cut vinyl letters and decals ensures a crisp appearance that will remain in place for years to come. But did you know that you can pair this product with other signage solutions for a highly effective one-two punch? Table throws. Printed on a colorful table cloth that perfectly suits your waiting room’s interior decor, add your message, motto or tag line to the mix. Depending on the seating plan for your location, this throw may be more easily visible to some patients. Banners. Retail retractable banner stands Orange County businesses commission are not just for stores any longer. In fact, plenty of physicians have begun to use these products to educate patients about products, seasonal health care concerns and also well-being facts that pertain to the clinic’s specialty. Floor graphics. If you have chosen not to place carpeting into your waiting room, consider the addition of floor graphics. Use them to highlight the longevity of your clinic, display the name and logo of the business or simply to introduce products that your staff strongly believes in. We can match your corporate colors! There is a wide variety of complementing products that further underscore the message you want your patients – and the visiting public in general – to take in. Talk to our signage experts for more information on the ideal product pairings or to get started on your order.